If default auto-made menu (Home link and few pages you have) is enough for your site, you may left it as it is. If you need more, for example you have a hundred of pages and there is no place in the menu for all of it of course, or you wish to add some custom links to your menu, then you need to create your own, so-called custom menu. 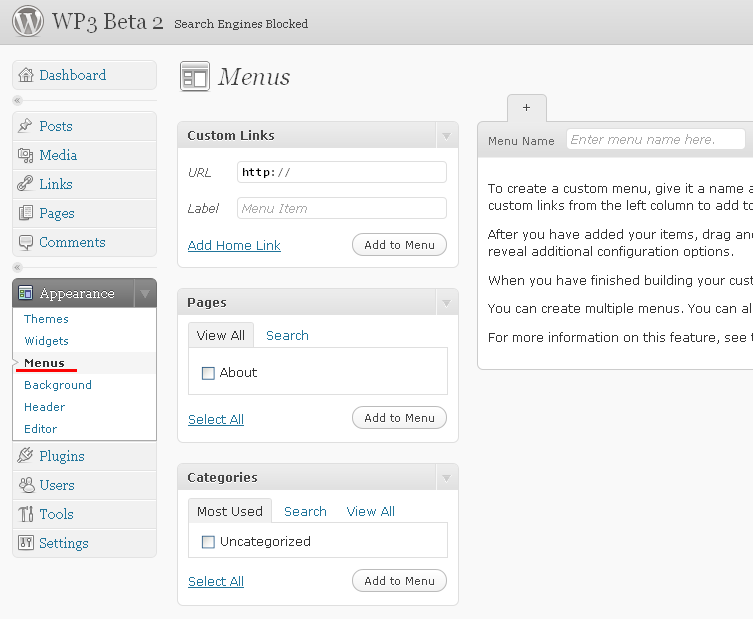 – menu editor section to the right. You can create new menu there, rearrange selected menu items, delete unneeded menu. Start with creation of new custom menu. 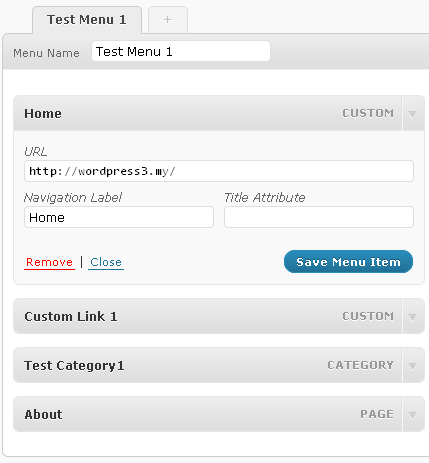 To create a custom menu, input its name into “Menu Name” input box and click Create Menu. You can edit any item at any time by click on the right side down arrow at the menu item title. Do not forget click “Save Menu Item” button when you finish editing. To change menu items order you can use drag and drop technique: just drag menu item to place according with its new order. Menu item background becomes lighter when you move mouse pointer over it. Adding submenu to some of the menu item is quite simple. 1st, add menu item which will be submenu item. 2nd, drag this item to the menu item under which you wish to have submenu and drop on it. That’s all. Simple, right? You can create multiple menus. To create another menu click tab with the plus symbol to the right from existing menu tab. Then act as described above already for new menu creation. If you have more than one menu defined at your “Menus” system be aware that your “Twentyten” theme uses the 1st one by default. Link to share this video is WordPress 3.0 menu system in action. This entry was posted on Sunday, May 9th, 2010 at 07:14	and is filed under General, WordPress. You can follow any responses to this entry through the RSS 2.0 feed. You can skip to the end and leave a response. Pinging is currently not allowed.